QUESTION: What is your practice’s most important tool? Chances are your telephone probably does not readily come to mind. When you stop and think of all the time, effort, and hundreds of dollars it takes to get your phone to ring once – you might agree. Conveying sympathy and friendliness on the phone in a matter of seconds takes personality and skill. Of course charisma is important – especially when a problem as personal as hearing is involved. However, all the personality in the world can’t replace the dollars won by being effective at converting phone calls to appointments. 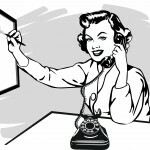 The fact is, most practice owners believe the front office staff (or even themselves) are doing wonderful on the phone. However, we listen to hundreds of calls each week and even practitioners themselves have issues from time to time when it comes to locking in appointments with reluctant fence-sitters. Want more appointments? Don’t give too many details over the phone. That’s what appointments are for. The bottom line is, we can all improve to some degree, no matter what we are doing or how much experience we have. Read on for more tips on setting more appointments (and in turn, selling more hearing aids). Don’t spend thousands on marketing campaigns – whether through direct mail, TV, radio or Internet – without first preparing and informing your staff. See our last blog for more details on this step. Convey your enthusiasm through your voice. Speak clearly & loudly! First impressions are important. Attitude, voice clarity, even your facial expression (you can literally hear it through the phone), sets the tone of the entire business. Would you ever spend $3,000 on anything without speaking to your spouse first? Always ask for third party! Otherwise you are setting the stage for a test no sale. For more information on how to ask for third party, call us for inside pointers! 4. Just Set the Appointment Already! This sounds harsh, I know, but in order to truly help your customers, they need to be in you office. Even if your front office staff has been with you for years and knows the ins and outs of the business, he or she is not the doctor or the sales person. Even if he or she knows the answer, just book the appointment and leave it to the professional to answer. You will have a much better time converting calls into sales if you are answering questions in person. Make it sound like you are setting aside time just for your patient, without giving too many options. Special Events don’t seem urgent or valuable when no one is coming in. Mr Jones is Thinking: Wow. This place is not busy at all. Should I be going here? Mr Jones Says: Ok… well I guess Tuesday morning would be ok.
Receptionist: Great! Would you like 9am? 10am? 11am? Mr Jones: Well, you know what, let me check with my wife and call back. Overly accommodating can sometimes sound unprofessional, and an open appointment book can open the door for Jones to think twice and change his mind. Once the caller hangs up, the chance of calling back is slim to none. Receptionist: What time of day works best for you and your guest (don’t forget third party!) Mr. So and So? I’ll try to squeeze you in. Mr. Jones: I am hoping for a morning appointment. Receptionist: Ok, how about Tuesday at 10 am. Mr. Jones: Oh. Yes it will. See you then. Everytime someone calls in, it is a sales call. You have to be prepared to rebut objections. Role play with your staff about how to answer pricing and insurance questions. Remember: NEVER give pricing over the phone. Your phone staff’s main goal: Set the appointment. NOT answer questions. If you answer all a potential client’s questions before they come in to see you, they may feel that they have received enough info to make a buying decision without making an appointment.